Are you planning a long road trip for your next vacation but still unsure how you’re going to fit all your gears in the car? Well, you’re not alone. Lack of space is a common theme among people who need to take their family, friends, pets, or all of them on a trip. You can put everything in the trunk, but stacking your bags in the trunk until you can’t see out the back window is dangerous. That huge of a blindspot is never a good thing to have when you’re traveling serious distance. This is where a hard-shell carrier or a roof cargo box comes into play. It gives you that extra storage for road trips, so you don’t need to leave anything behind for your week-long vacation. Air mattresses, tents, sleeping bag, extra gas, and other camping gears will fit right in. The big question now is, “which one should you pick?” There are too many of them to choose from. Luckily, you’re here now. And we have the best candidates that will carry your every gear safely to your destination. That’s right. We have reviewed seven of the best rooftop cargo boxes that so many people love. These boxes will serve you for tens of thousands of miles and years to come. The Yakima Rocketbox is a sturdy roof cargo box that’s big enough for skis, boots, helmets, luggage, sleeping bags, and lots of extra camping gears. It has an aerodynamic design that minimizes drag. It helps with mileage and decreases wind noise at high speed. The box does not need any assembly. The moment it arrives at your door, you can immediately install it on your car. The Rocketbox is very easy to mount. It will take at most 15 minutes. You only need to adjust the box’s position on the crossbars and tighten four screws. The mounting hardware fits any kind of crossbars. Whether you have a square, round, or aerodynamic bars installed, the Rocketbox will mount easily and safely. However, you still need help to put the box onto the roof. This thing is huge and weighs 53 pounds. With clever mounting positioning, this carrier does not obstruct access to the hatch. This makes the Rocketbox an ideal choice for small cars. Its dual-side opening is convenient because it allows you to access the cargo from either side. Very useful when you’re forced to park close to a large vehicle, a wall, or a large object. This box is really well-made. It stands up to the elements without a hitch. The material doesn’t flex a lot, so you don’t end up with dead bugs inside the box. The push button security with SKS lock cores keeps everything inside the shell safe when you leave the car in the parking lot. They won’t stop a determined thief, but they work well as deterrents. The Thule Sonic XXL is a highly functional roof cargo box offering the perfect combination of usability and style. This box looks sleek, very sleek. If you have a fancy SUV and afraid it will look out of place on your car, don’t be. As you might have guessed from the name, the Thule Sonic XXL is a massive cargo carrier designed to give you the best extra space a cargo box can offer. It’s not the best for small cars, but for large SUVs and family vans this is a fantastic choice. After all, even if you have a big car, you can always use the extra cargo space the Sonic XXL provides. Your family can sit comfortably in the passenger seats without any extra baggage compromising their legroom and everything. This box mounts securely on any crossbar types. You’ll hear an audible click when the Accutight clamps have gripped the bars firmly. Thanks to the dual-side opening feature, you can load and unload your stuff from either side. The oversized SecureLock will not leave you guessing whether you’ve closed the box properly or not. With its aerodynamic design, the Sonic XXL cuts through the wind easily including crosswinds. Crosswinds can make your car sway dangerously when you’re driving at high speed. Sonic XXL’s design will minimize this. That aerodynamic design also means minimal wind noise. You will only notice it when you roll down the window. The rear portion of the Sonic XXL is angled so that you can still open the hatch or trunk easily. Want a sleek-looking cargo carrier for your car? Then you may want to give the Rhino Master Fit a shot. With its elegant streamline design and metallic finish, it is an amazing rooftop cargo box to look at. It looks great on any car whether it’s a hot hatch, SUV, or family van. Its modern look is not its only forte. This is a highly functional rooftop box with ample storage space and tons of useful features. The box is made of amorphous ABS plastic. Its toughness and impact resistance makes it an ideal material for cargo carriers. It maintains these two characteristics within a wide temperature range, so the box is equally reliable in winter as it is in summer. This luggage carrier is available in 14 and 17.5 cubic feet. You can pick the one most fitting to your cargo needs. The 14 cubic feet model fits smallish car and won’t feel absurdly huge on its rooftop. Installation is a snap on any type of racks. 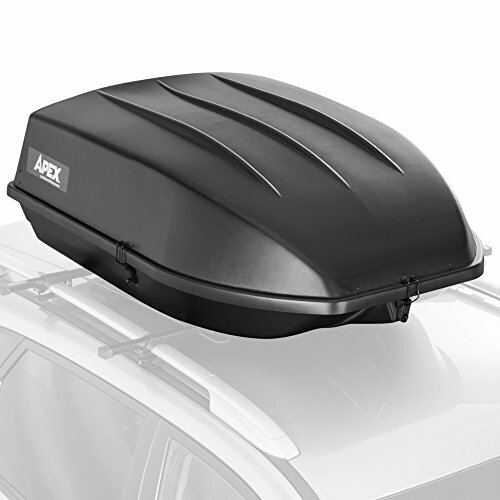 Since this carrier is not too wide, you can still fit a bike rack on the roof should you need it. It is simple to adjust the mounting points front to back and left to right. You can optimize the limited space on your car’s roof easily without blocking the hatch from opening fully. You can open the box from either side, and it stays open while you’re loading or unloading your gears. Rhino’s three-point locking system keeps your gear safe from prying hands. You can relax when you park the car while you and your family are stopping for lunch. The Whispar WB701 Aero is a beautiful and sleek roof cargo box. 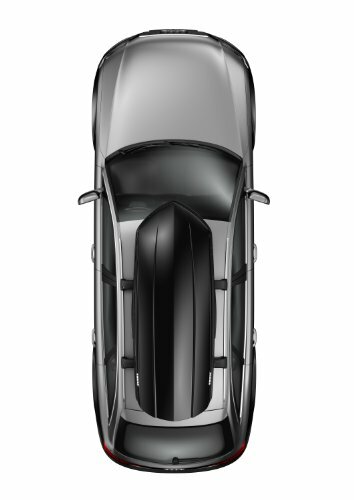 It features aerodynamic styling finished with premium black and silver automotive paint. With 13 cubic feet of cargo carrying capacity, you can rely on it when you need to take your skis, snowboards, golf clubs, or camping gears. The box is long enough to accommodate skis up to 190cm/75inches long. The build quality of WB701 is impeccable. Everything about it, including the mounting hardware, feels tough and durable. The dual layer lid structure is stiff, improving the overall stability when you drive at high speed and also makes it easier to open and close. By using the clamp buckle system, mounting the WB701 has never been easier. This system is compatible with almost all types or crossbars, and you need absolutely no tools to install it. There’s a lever underneath the box that you can pull to allow the clamp to slide forward and backward. This enables you to customized the box position, ensuring no hindrance to the hatch when opening. Once you set the position, turn the knob until the clamp grabs the crossbar then pull back the buckle. The WB170 includes a thick cargo mat that acts as a padding for your cargo. On bumpy rides, the mat cushions the cargo and the bottom of the box so they won’t get damaged easily. Opening the box feels light thanks to the spring-loaded hinges. Dual-side opening allows access to cargo from both the passenger side and driver side. The locking mechanism is also available on both sides. The SportRack Aero XL is just huge. Its 18-cubic-feet capacity makes it one of the biggest carrier boxes you can find these days. It has plenty of room for your camping gears, sports equipment, water, and just about anything your family thinks they ought to bring for the long trip. It only weighs 38 pounds but can take 110 pounds of load. This thing is pretty lightweight compared to many other rooftop cargo carriers. That makes it easier for you to put it onto the roof rack. This cargo carrier works well with factory and aftermarket roof racks. It just clamps on tightly and securely without any sliding or wobbling when you drive through various road conditions and terrains. Even though it’s huge, the streamline design keeps your mileage within a reasonable range. Wind noise is fairly non-existent when you go below 75mph. Even when you push the pedal, the sound coming from the radio is enough to block any wind noise the box makes. This is truly a well-made box that will last years through downpours, burning sun, and freezing winter. ABS has been known for its durability, and it makes such a perfect sense as cargo box materials. Wherever your trip is taking you, this box will hold everything you need and more. It only opens at the rear but still easy to load and unload your stuff. It shuts tight and lockable too. You won’t find any water leaking or dead bugs sticking to your luggage when you get to your destination. You won’t be able to carry too much with only 10 cubic feet of capacity. However, that’s still a generous amount of extra space. Measuring 58-inches x 34-inches x 15-inches, you have plenty of room when you need to take your golf set, sleeping bags, tents, spare clothes, towels, firewoods, and other camping gears. 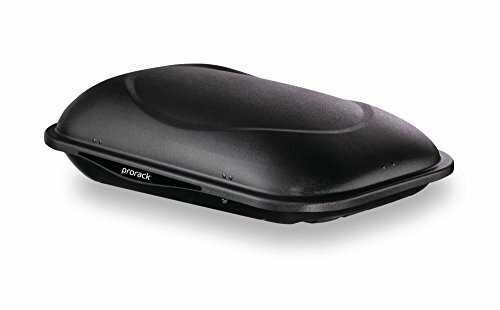 This Prorack cargo box only weighs 25 pounds, and that may raise some concern about its durability. Thankfully, there is no trace of it being flimsy and unreliable. It is as sturdy as roof cargo boxes with a much higher price tag. The biggest difference is it doesn’t look as sleek as the more expensive boxes. It also lacks the dual-opening feature. You can only open the box from the passenger side. However, the security feature of this box is nothing to scoff at. It has a built-in key lock to keep all your stuff secure. Because the rack comes fully assembled, all that’s left for you to do is to mount it on the crossbars using the supplied U-bolt attachments. The slots for the U-bolt are not covered, though. When you speed through heavy downpours, water may seep in. Keep everything in a waterproof bag and you’ll be okay. If you want to keep it simple, you can just cover the exposed slots with duct tape. There’s slight wind noise when you go over 60 but not enough to be disruptive. Moreover, when you speed it up some more, the front part will stay shut and won’t open up. If you’re looking for a slim and sleek hard-shell carrier, this Apex cargo carrier is not what you’re looking for. This box is made for people who put function over fashion. It’s not ugly, but it sure won’t win a beauty pageant against its competitor. The box is made of durable and high-quality plastic that will stand any weather in any season. The outside dimension of this box is 57-inches x 39-inches x 19.5-inches which translates to 18 cubic feet of storage space. The maximum weight capacity is 110 pounds, and when you need to make sure you have everything covered, 18 cubic feet or 110 pounds is more than plenty. You can fit two large suitcases and a baby stroller in it with room to spare. Mind you, it’s one bulky cargo carrier, so you may require assistance to lift it safely to the rack without injuring yourself or damaging the car plus the box. Mounting this cargo carrier itself is straightforward. No problem with factory or aftermarket crossbars. It takes no more than ten minutes to install this on the roof rack. You can do it on your own without any tools. Technically, this box only opens from the back. However, it opens so wide you can easily slip bags and other stuff through the left and right side opening. With the hinges located at the front, you won’t have to worry about the box opening up while you’re traveling down the highways. That’s just not going to happen. For added security, a locking mechanism is located on the back lid. It’s nothing fancy, but it works as intended. Everything is dry and clean: With a roof cargo box, you don’t need to worry about driving under torrential rain. Everything you put in it will be as dry as when you put them in. Dead bugs splatting on your cargo are no issues either when you have a box that stays shut even on highway speed. Secure: A rooftop box with built-in lock is a nice feature that gives you the peace of mind. When you go on a 1,000 miles trip, you’re going to stop a lot to eat, fuel up, and go to the toilet. That lock will keep your stuff secured in the box while you’re busy doing all of that and leave the car in the parking lot. Having your camping gear stolen can seriously ruin your holiday mood. Looks good: Nobody likes to put an ugly-looking box on their car. Yes, even it’s an old car. Rooftop cargo boxes come in either matte or glossy finish. Both can look good, but a box with a glossy finish is easier to clean than the matte one. They look sleeker too. Ease of use: When you’re already too busy preparing everything for your camping trip, a cargo carrier that’s easy to install, open, close, load, and unload is a real blessing. Cargo box installation is as simple as tightening U-bolts or clamps. Clamps are the easiest by far. You don’t need any tools whatsoever. A wide opening makes loading and unloading the cargo easier without having to tear up the whole upper part. A box with dual-side opening is always nice to have. However, the one that only opens at the back is good enough as long as the opening is wide because you’ll be able to load and unload from the sides too. Mild decrease in MPG: A rooftop cargo box will drag your mileage down. That’s a given. However, those with aerodynamic design won’t drag the mileage too far down. When compared to an ordinary rooftop cargo basket, the boxes win hands down. Cargo baskets have wind fairing to help with diminishing mileage and wind noise, but the cargo sitting in it will still be a drag. 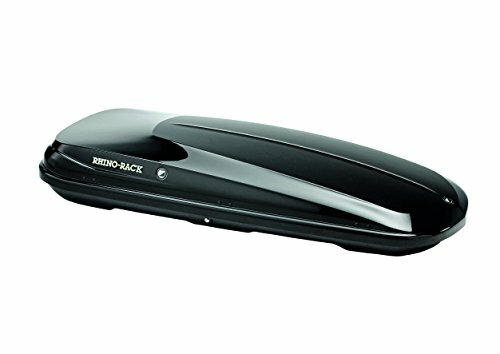 Aerodynamic: All hardshell-carriers have aerodynamic designs that allow them to cut through the wind easily. You will only get a slight drop in mpg. The biggest advantage of the aerodynamic design, however, is less wind noise at high speed. When you’re traveling for thousands of miles, you do not want to hear that annoying wind noise. Waterproof: Cargo boxes are inherently waterproof. Hard plastic is impermeable by water. The only way water can get in is when the lid is not closed You can prevent that easily by not over packing the box. Better protection against theft: Many cargo boxes have built-in locks. Those locks won’t stop a determined thief armed with pry bars. However, you have to admit that the hard outer shell and locks are quite handy deterrence. Heavy and cumbersome to lift: An empty cargo box can still heavy quite a lot. That coupled with the sheer size make a cargo box hard to lift by one person. Expensive: Buying a cargo box is quite an investment. Unless you’re a frequent traveler, buying a cargo box may not be the best choice. Limited carry: Big and bulky items are hard to fit in a cargo box. You need to arrange the cargo in the center part because the front and sides are sloped to improved aerodynamic. A pain to store: Its rigidity means you can’t fold down a cargo box. You need to check if you have that extra space in the garage to put it when not in use. Although Yakima and Thule are the de-facto leaders in the world of roof cargo boxes, no one can force you to pick one of the two. It all boils down to your own needs and wants. If a rooftop box from another brand fulfills your requirements well, then go ahead and grab that one. Mega size rooftop box is nice because you will always room to spare just in case. However, you also need to think about the bulkiness, which makes it cumbersome to mount and unmounts. Do you have the space to store it when not in use? Cargo boxes aren’t foldable, and you can’t disassemble them easily too. If you have very limited space in the garage, you may need to shift things around in there to make space for the box later. A pair of wall hooks with a hanging piece of plywood between them is a smart way to store your cargo box in upright position. If moving things around or installing to wall hooks is not possible, then a cargo basket with waterproof cargo bags will make a better choice for you. It’s easy to tear a cargo basket apart for storage. Buy the cargo box long before you need it. It will give you plenty of time to play around with it and do test drive around the block with the box installed. Adding extra weight on the roof will shift the car’s center of gravity so you’ll need to adjust the way you drive. Taking care of problems before the big day will make your trip much more enjoyable. Take note of the height of your garage door. If it’s shorter than the height of your car plus the carrier box you’re about to order, you will need to install the roof on your driveway. Car roof storage carriers are mounted on crossbars. If you don’t have them installed already, you need to install them now. There are three types of bars: Aero, round, and square. Whenever possible, install Aero bars. Their slim profile cause the least wind noise compared to the other two. If, for one reason or another, you don’t want crossbars on your car, look for different cargo carrier alternatives. A hitch-mounted cargo carrier is also a viable solution for your storage needs. Never overstuff a roof cargo box. Well, unless you like having your gears fly out of the box while you’re driving on the highway. Aerodynamically-designed cargo carrier will have limited space on the front. Arrange the cargo so that bigger items are placed in the center part. Getting a rooftop cargo box is an excellent way to free up the cabin for your passenger. Some things will get in the way and just cumbersome when placed inside the car. Other stuff, like a spare gas tank, is clearly safer when placed outside of the car. Your cabin won’t reek of gasoline that way too. Remember, you don’t have to pick one that everybody else gets. Pick the one that fits your need in terms of capacity, ease of use, features, and whatever else you deem important.